At Caprikorn Farm we start with our best tasting goat milk, from goats allowed to browse as nature intended. This natural diet produces milk of exceptional flavor – perfect for cheese. Our raw goat milk ceddar cheese (plain and flavored) is literally hand made in small batches in the tradition of the best artisanal farmstead cheeses. 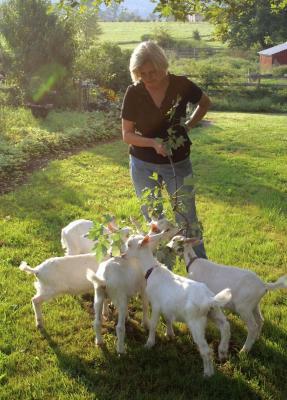 We are Maryland’s first On Farm Home Licensed Goat Cheese Processor. We accept cash or all major credit cards. Our products are available at our farm or at many MD and VA farmer's market locations. Every Saturday May 16 - Nov. 21, 2015 9 am - 1 pm near Rockville Town Center on the corner of Route 28 and Monroe Street. Farmer's market is located at Faith Baptist Church parking lot. Saturdays, May through October, 8am-noon.